(CNN) -- Hamburg and Bayer Leverkusen remain level on points at the top of the German Bundesliga after victories on Saturday, while Bayern Munich stepped into form ahead of the Champions League group stages with a crushing win. 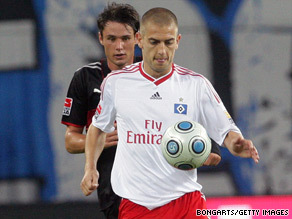 Hamburg goalscorer Mladen Petric holds off Stuttgart's Christian Trasch during his side's 3-1 win. A 3-1 win away to Stuttgart in the late match put Hamburg on top of goal difference, with 13 points from five matches, while Bayern moved up to fourth -- five points adrift of the leaders -- with a 5-1 demolition of Borussia Dortmund. Mladen Petric bounced back from Croatia's humiliating 5-1 World Cup qualifying defeat by England to put Hamburg ahead after half an hour against the run of play with a 20-yard effort that caught veteran goalkeeper Jens Lehmann too far off his line. Dutchman Eljero Elia, who late goal ended Scotland's hopes of reaching the World Cup finals, made it 2-0 in the 58th minute after receiving a pass from David Jarolim outside the penalty area, turning and firing a shot into the bottom right-hand corner of the net. Petric had an effort ruled out for a foul on Mathieu Delpierre before Stuttgart pulled one back in the 62nd minute when Russian striker Pavel Pogrebnyak chipped over keeper Frank Rost after being set free by Christian Trasch. Brazilian Ze Roberto added a third in stoppage time from 20 yards. Bayern, who travel to Israel to play Maccabi Haifa on Tuesday, notched a second successive victory after coming from behind at Dortmund's Westfalen Stadion. Former Bayern defender Mats Hummels headed the hosts ahead in the 10th minute from Nuri Sahin's free-kick, but Mario Gomez leveled 10 minutes before halftime as the striker made up for an earlier miss from Arjen Robben's cross by netting from close range. Bayern coach Louis van Gaal replaced Gomez with Franck Ribery in the second half, and the Frenchman was involved as Bastian Schweinsteiger made it 2-1 with a low shot from outside the area. Ribery then smashed home a stunning free-kick goal in the 64th minute and went some way to dispel rumors of a falling-out with Van Gaal by racing to celebrate with the Dutchman. Thomas Muller wrapped up the victory with two late goals, first beating Roman Weidenfeller at the third attempt after the goalkeeper had denied Robben and Schweinsteiger in the 78th minute. He then crashed a shot just under the crossbar from outside the penalty box with two minutes left. Leverkusen survived a late fightback to win 3-2 away to defending champions Wolfsburg, who had goalkeeper Diego Benaglio sent off for a professional foul on Eren Derdiyok after only 31 minutes. Simon Rolfes opened the scoring from close range eight minutes later after substitute Andre Lenz parried efforts by Derdiyok and Obafemi Martins. Rolfes made it 2-0 from the penalty spot after 51 minutes after Derdiyok was fouled by Andrea Barzagli. But Swiss forward Derdiyok then turned villain two minutes later as he was sent off after being given a second yellow card for a foul on the Wolfsburg defender. However, Stefan Kiessling made it 3-0 after 58 minutes before Zvjezdan Misimovic reduced the deficit with a free-kick on 76 and Grafite's penalty four minutes later, after Hans Sarpei felled Edin Dzeko, set up a tense finish. In Saturday's other matches, Hertha Berlin crashed to a fourth consecutive league defeat after conceding two goals in the final 10 minutes to lose 2-1 at Mainz. Hoffenheim overpowered Bochum 3-0, Eintracht Frankfurt remained unbeaten after a 2-0 victory at Freiburg and Nurnberg beat Borussia Monchengladbach 1-0 thanks to an early goal from Peer Kluge.